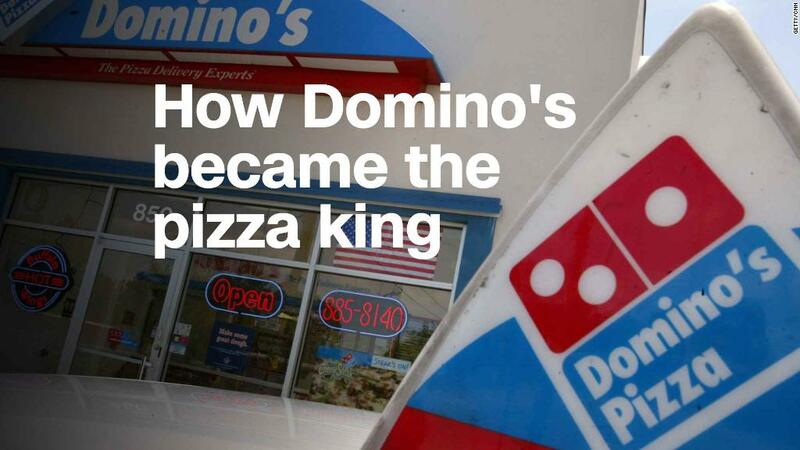 Domino's is the new pizza king. Savvy marketing, innovative tech and creative ordering methods lifted Domino's sales over Pizza Hut for the first time last year. "Delivery is what the consumer wants. And Domino's does it best," said Stephen Dutton, an analyst at Euromonitor International. "When you're sitting at home watching Netflix, you're going to think of Domino's." The company has transformed itself since a tumultuous stretch during the late 2000s. Domino's (DPZ) stock bottomed out at under $3 a share in 2008. The following year, two employees posted a food tampering video on YouTube. And it faced an even bigger problem: Customers thought the pizza was lousy. So Domino's tossed out the playbook. Led by CEO Patrick Doyle, the company launched what it called the "pizza turnaround" in 2010. Doyle, who is stepping down in June, appeared in ads with Domino's workers reading blunt reviews: "worst pizza I've ever had," "sauce tastes like ketchup" and "the crust tastes like cardboard." Domino's said it heard the critics and scrapped its 49-year-old pizza recipe. It introduced a value offering in 2011 -- two medium, two-topping pizzas for $5.99 each -- and expanded the deal to allow customers to mix and match food as it added sandwiches, pasta and chicken and overhauled 85% of the menu. Cheaper food than rivals Pizza Hut, Papa John's and Little Caesars and upgraded choices won back customers and drove sales growth. Domino's has surpassed Pizza Hut as the market share leader with a 17% hold of the quick-service pizza business and its stock has jumped to $223. Doyle also convinced franchise owners to fund the re-invention, noted Aaron Allen, a restaurant consultant. Franchisees own more than 90% of Domino's 15,000 stores worldwide and Domino's makes money through franchise fees and selling the stores ingredients and equipment. Russell Weiner, Domino's COO and its former marketing chief, said in an interview that the company has taken a different approach to brand building than other restaurants. Weiner pointed to catchy advertising campaigns such as a failed effort to develop a cookie pizza and a spot with Doyle holding up a picture of a crushed Domino's pizza in a delivery gone wrong. "Fast food marketing is designed around product of the month with a price special," Weiner said. "How good can your pizza be if you have to change it every month and if you have to price it differently every month?" Unlike rivals, Domino's focuses on creating new tech and then develops engaging advertising around it to connect with customers and stand out in a fragmented field with national chains, regional stores and independent players. In 2015, Domino's unveiled a custom delivery vehicle with a heating oven called the DXP. There are only 150 DXP vehicles on the road, but the ads generated buzz and contributed to Domino's 30% control of the pizza delivery market. "We think people look at that and say 'Wow. How cool is that? '...Let me call Domino's,'" Weiner said. But not as many people are ordering over the phone these days. More than 60% Domino's sales come through digital channels. That's good for business: Customers spend more money online than over the phone as they sort through the menu and add items to their basket. All digital orders run through Domino's custom operating system, which helps franchisees keep transaction costs down and gives Domino's insights about their customers. The database is a "competitive advantage," said Stifel analyst Chris O'Cull. Domino's used the data to create a loyalty rewards program in 2015, which now has 15 million active users. Those analytics also helped Domino's develop new ways to order, including texting a pizza and through Alexa, Google Home, Twitter, Facebook, Slack, Apple Watch, Smart TVs and Ford cars. Domino's promoted ordering off Amazon Echo in a memorable spoof of a scene from Ferris Bueller. It's also testing drone and robot delivery overseas and partnered with Ford on self-driving delivery. Ford said last month that it would begin testing the cars in Miami. "They're so far ahead of the other players," said O'Cull. "They're going to continue to take market share at a fast pace." Fast-casual pizza chains such as Blaze, Marco's and MOD are growing market share, but analysts agree that they aren't going head-to-head with Domino's. "They're never going to do delivery well because the pizza is too thin. It doesn't retain the heat [and] the toppings are too heavy," O'Cull said. Fast-casual pizza "competes more with Chipotle." Pizza Hut may still be Domino's biggest threat. Its sales are improving and parent company Yum (YUM) invested $130 million in the chain last year to strengthen delivery and get digital ordering up to speed. Pizza Hut announced plans to hire 14,000 new delivery drivers, created a delivery tracker and a rewards program. It became the official sponsor of the NFL last month. Papa John's (PZZA) has lagged the two. John Schnatter, Papa John's founder and CEO who stepped down in January, blamed the company's struggles in part on lower NFL ratings. O'Cull argued Papa John's "doesn't have a compelling value message." Papa John's claims "better ingredients, better pizza" to justify higher prices, but customers don't see it as "significantly higher quality than Domino's or Pizza Hut," he said. Domino's isn't only competing with other pizza chains for delivery though. Choices are expanding as more dine-in restaurants partner with delivery services such as Grubhub (GRUB), DoorDash, Seamless and Uber Eats, noted Bernstein analyst Jeffrey Bernstein. "Pizza will be fighting McDonald's and Outback Steakhouse," he said. But O'Cull believes many restaurant partnerships with third-party delivery services are a trap. By paying GrubHub or Uber Eats, restaurants risk "cannibalizing themselves" as dine-in traffic slows and profit shrinks. "Third-party aggregators are the fox in the henhouse," he said.